Another aspect of our comprehensive, modern and integrated approach to mosquito control is chemical control. 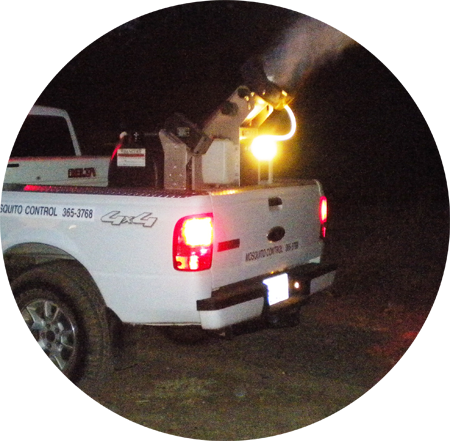 The Shasta Mosquito and Vector Control District uses a variety of environmentally compatible chemicals to control mosquito larvae and adults without causing harm to non-target organisms. Some of our products for larval control are based on unique bacteria, which produce protein substances that kill mosquito larva but are non-toxic to other insects and other animals. Insect growth regulators, which interrupt the mosquito’s life cycle, are also used. Other chemicals are applied which float on the surface of the water and prevent the mosquito larvae from obtaining air to breathe. Adult mosquitoes are killed using ultra-low-volume aerosol applications of modern pyrethrin-based chemicals. The District has five weather stations which are used to assure that application of chemicals to control adult mosquitoes takes place when conditions are right to get the maximum effectiveness against mosquitoes while having the least possible adverse effects on the environment. All of the mosquito control products used by the District are easily biodegradable and do not persist in the environment.